One is an author, actor, and playwright who as a child escaped Chile during the Pinochet coup and later returned to join the underground resistance movement. The other is a Welsh/Metis-Anishnawbe dance artist and choreographer who trained at York University and founded Toronto’s MataDanze Collective before relocating to Vancouver. But while their histories may have been worlds apart, when the Chan Centre brought Carmen Aguirre and Olivia C. Davies together to create a piece for Beyond Words — an interdisciplinary performance series — they soon found common ground. “They both experienced significant loss at a young age, and they had other personal connections, which they used to create the work,” says Wendy Atkinson, who curates the series. In the end, the artists built the work around the true story of a woman whose mother was kidnapped during the 1970s Argentinean military dictatorship, and combined it with Davies’ experience. The effect was breathtaking. The collaboration is just one of several groundbreaking pieces the Chan Centre has commissioned. Vancouver writers Aislinn Hunter and Nancy Lee were paired with choreographers Anusha Fernando and Paras Terezakis to fuse writing and movement, while environmental activist Severn Cullis-Suzuki and Inuit vocalist Tanya Tagaq came together in a powerhouse performance that delved into the global sustainability crisis. For the Radius series, musica intima and the Turning Point Ensemble collaborated with music collective Nu:BC to premiere innovative new works by Montreal composer Michael Oesterle and San Francisco’s Aaron Gervais — both of them Chan Centre commissions. In 2005, Tanya Tagaq and the Kronos Quartet performed Nunavut, a co-commission with the Chan Centre, the PuSh Festival, CBC, the National Endowment for the Arts, and the Canada Council that’s still being talked about to this day. The Chan Centre has also hosted several world premieres, including Sir Peter Maxwell Davies’ Job oratorio, which featured the CBC Radio Orchestra, and Stephen Chatman’s Earth Songs, which was commissioned to commemorate UBC’s 2008 centennial and featured opera legend Ben Heppner. 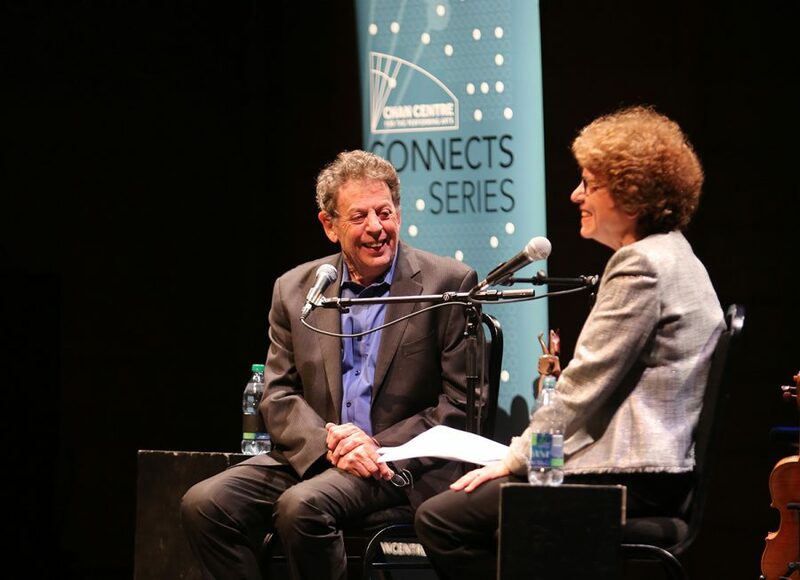 The 2013 world premiere of Philip Glass’ String Quartet No. 6 by the Kronos Quartet — which included an introductory talk by Glass himself — was extraordinary. Of course, many performing arts venues only present works; they don’t participate in their creation. But at the Chan Centre, helping to cultivate leading-edge art and share timely, topical pieces continues to be a key focus — and one that is aided by the Chan Centre endowment. It’s a leap of faith for all involved — the Chan Centre, the artists, and the audience — but one that has proven to be deeply rewarding.